Please enjoy photograph slide shows below this essay on the Pol Pot regime. Temples in Phnom Penh, Cambodia. Happy Fourth of July from Cambodia! It is so easy to be proud to be a U.S. citizen while here, where the people, (called "Khmer" and pronounced "Keh - my,") are incredibly hospitable, gracious and appreciative of foreigners. Cambodia is a place I had known only by name, a place I considered with mere curiosity that was hardly awakened even during a troubling phone call to a man named Churn in 2000. Visitors leave tokens of respect at a mass grave in one of the many "Killing Fields" in Cambodia. Cambodia has had a wild history, including nearly a century as a French protectorate that ended in 1953. But three long and horrific events beginning in the late 1960s all but destroyed this beautiful country. 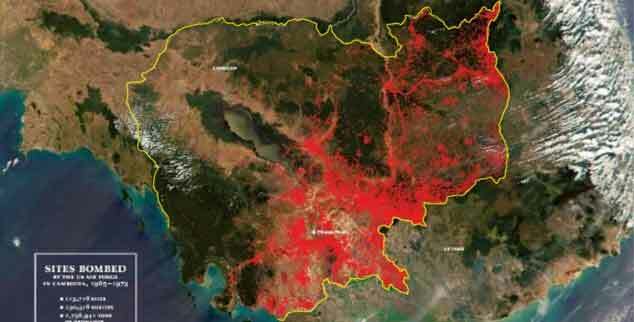 First, the U.S. thoroughly bombed eastern Cambodia for years during the Vietnam War. 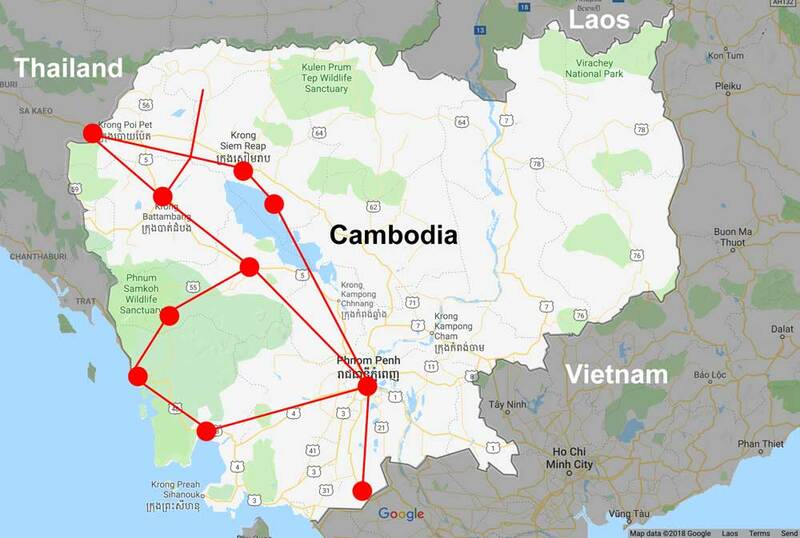 Cambodia had declared neutrality, but aided Communists who used the country to transport arms and supplies. After bombs destroyed property, a civil war lasting several years dismantled the society. Then, Pol Pot’s half-decade reign of genocide in the late 1970s, killed more than a million people and created a massive refugee crisis. The U.S. opened its doors, and during the next two decades, we welcomed nearly 200,000 Cambodian refugees, most of whom eventually became U.S. citizens. 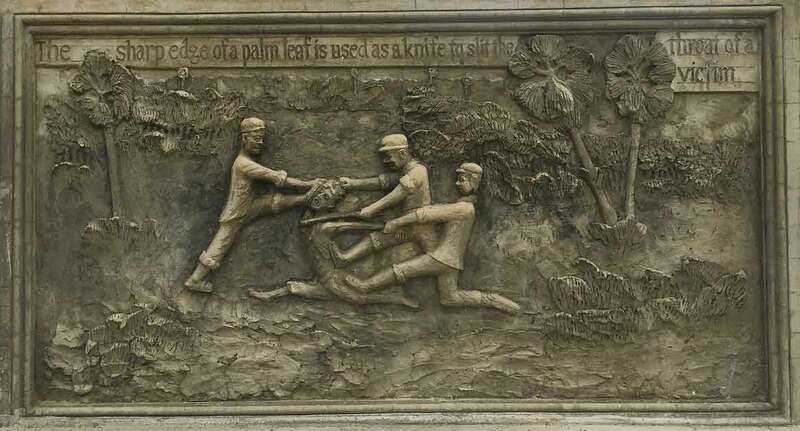 Panels on the Well of Shadows monument in Battambang, Cambodia, describe horrors of the Pol Pot regime in the late 1970s. That phone call I made in 2000 was one of several to my mother's friends to tell them of her death. None of the calls was pleasant, but my conversation with Churn stands out because of his reaction; he was devastated. Carefree children once roamed the halls of this school near Phnom Penh. Then Pol Pot imprisoned and tortured thousands of innocent people here, . Photos of the imprisoned are on display in the S-21 museum. I had not seen it coming. I knew that Churn and his family were Cambodian refugees and that my mother's church in Brunswick, Maine had hosted them, helping them with their new lives in their new country. She had spoken of the family often, and I know that she loved them. What I had not realized until my travels through Cambodia, was just how much my mother, (and other refugee hosts,) must have meant to these people in their desperate hours. Once a swingset on the children's playground, torturers hung imprisoned Cambodians from this until they acquiesced or died. Rules for prisoners of the Khmer Rouge. A hallway among cells in the notorious S-21 prison. 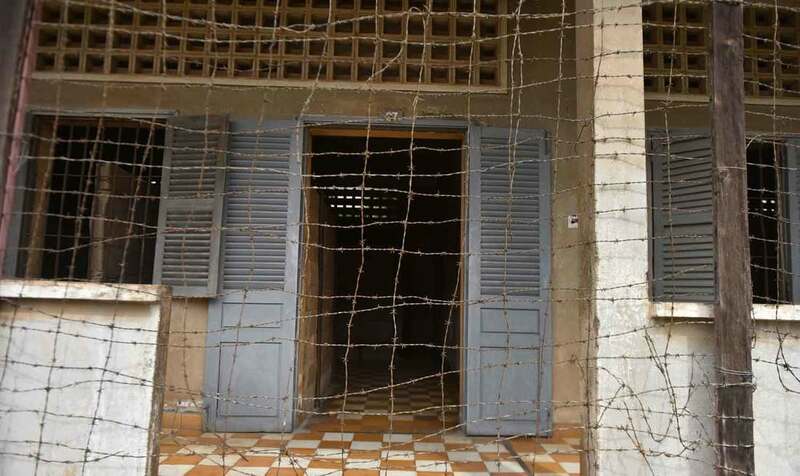 Barbed wire on upper floors discouraged imprisoned Cambodians from jumping to their deaths. I have visited the regime's largest "killing field; Choeung Ek, a former orchard outside the capital, where in the late 1970s, busloads of people arrived weekly and were killed as quickly, cheaply and inhumanely as possible. Exhumed mass graves in Choeung Ek, where an estimated 20,000 people were killed in the late 1970s. A large tree there is adorned with colorful string bracelets given by visitors. It is called the "Killing Tree" because guards there would kill children by beating their heads against the trunk. ​I have looked at some of the 5,000 human skulls that fill a small tower there. I cannot begin to describe the grotesque events that came to be this horrific display. I have no more words, which compels me to consider my conversation with Churn — A grown man sobbing. He had lived through a life of unspeakable horror, and the news of the death of a person who had helped him and his family escape that horror had left him speechless.